The largest fireworks display on the south side of Metro Atlanta, the Papa John's Pizza Fireworks Extravaganza, exploded over the pit lane drag strip for a special July 4th running of the ever popular O'Reilly Auto Parts Friday Night Drags and Show and Shine at Atlanta Motor Speedway on Wednesday Night. 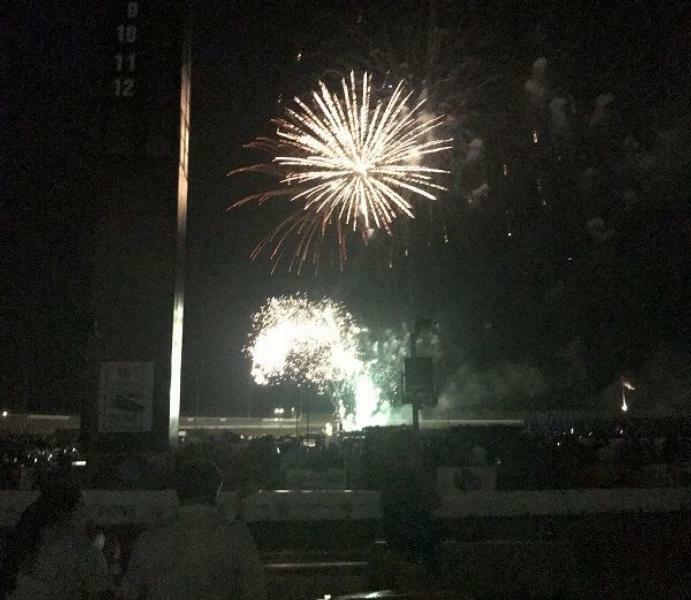 With anticipation building for the dazzling display of fireworks to celebrate Independence Day at the Speedway, smoke first filled the air. Featuring the Super Pro division, the Peach Pass Burnout Zone pitted competitors against one another in a winner-take-all tire smoking burnout competition before they took off down the strip. Working in a new engine helped Cliff "The Breeze" Waters of Jonesboro rise to the top of his division for the first round smoke screen he created behind the wheel of his 1985 Ford Ranger. "This was a new motor so we had to get some heat into it and everything," explained Waters. "It was kind of a good deal to win it because it was somewhat surprising." As Waters celebrated his victory, fans were treated to some high octante straight-line speed with the fastest cars making a trip down the pit lane drag strip early in eliminations. A break in the action midway throught he frist round allowed the night sky to light up with a spectacular fireworks display. As the racing resumed on the pit lane drag strip, one of the most competitive divisions at Drags, the Summit Racing Equipment Sportsman, saw Vincent Varela of Jonesboro in his 1979 Mazda RX7 collect the final round victory off a red-light by Jon Stoval and his 2006 Dodge Viper. "Just trimming that tree down," said Varela when asked about his success in the early rounds to advance to the final. "It's the right set up. One-hundred, eighty-nine cubic inches against big blocks and small blocks - you can't go wrong." For Varela, it was his first final round victory of the season in his second appearance of the season at Friday Night Drags in the Sportsman division. Other noteable winners include Williamson's Doug Ragan and his 1993 Firebird as he collected the final round victory in the QuikTrip Pro division. Making his first appearnace at Friday Night Drags this season, Dayquan Demerite of Lilburm dominated the Diamond Resorts Factory Street Divison as he mowed down five competitors on his way to a final round victory over Eric Samples of Hampton and his 2018 Ford Mustang. The Show-N-Shine competition featured everything from new imports to classic muscle cars and automobiles ranging as far back as the 1930s. Those vehicles then took part in the Speedway Cruise following judging. Atlanta Motor Speedway's O'Reilly Auto Parts Friday Night Drags & Show-N-Shine is idle this Friday before returning to the pit lane drag strip on Friday, July 13th for the Southeast Gassers Association Nostalgia Night prestned by Harbin's Mechanial Services. Grandstand gates open at 6:30 p.m., and nightly drag race eliminations start just after 9:00 p.m. Entry to drag race or for the Show-N-Shine is just $20 or competitors can purchase a combo ticket for $30. Spectator tickets are just $10, and children 5 and under are free. More information can be found at www.atlantamotorspeedway.com/drags or by calling the Atlanta Motor Speedway Ticket Office at (770) 946-4211.